Nautical-inspired looks come and go every year, so it seems a bit silly to call them a "trend." Although the appeal of sailor stripes has endured fashion's seasonal whims, I don't think I've ever seen them as trendy as they are this season. Breton stripes are a ubiquitous sight downtown; every other girl that I see is in a striped top. I can certainly see the appeal of stripes because they add visual interest to any outfit. They're classic and stylish and you feel like you tried to put together a cute outfit, but you're not so far out of your sartorial comfort zone that you feel awkward. 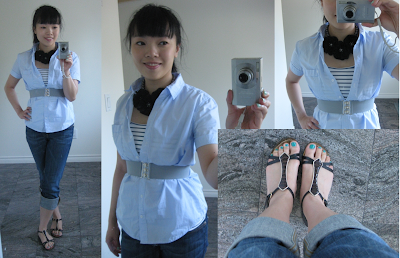 I know this outfit wouldn't have been quite as satisfactory if I'd used a solid-coloured cami for layering. Are you a fan of stripes? How have you been wearing them this season? This season.. I don't think so.. Maybe 2 or 3 times. I was a fan of stripes years ago.. Now I still thinking that it's great to wear them sometimes. It's a classical! I love stripes! I always have and always will. I like them bold and unexpected, and styled in unusual ways. Lisa, I LOVE this! The dark necklace against the pale shirt? Perfection! Lovely summer layers, darling L! And look at your tiny little waist ~ gorgeous! I'm always a fan of stripes both horizontal and vertical, slim and wide - any time of the year. Stripes are classic! Your sandals are very cute. I'm a HUGE fan of stripes. Black or navy stripes are classic and definitely not trends. I'm still on the search for a perfect, loose-fitting black and white stripe shirt. and the stripes is never die.. I like stripes, but I don't do nautical. I kinda hate nautical themes in pretty much everything -- decor, outfits, etc. I also am not a fan of navy somehow. i like this look! very cute^__^ thanks for sharing.